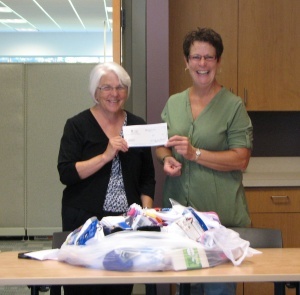 To help struggling families with the back to school rush, Mid Michigan Community Action staff donated 223 pairs of socks and $125 to the Clare County DHS’ Back to School Program. Every year, families face a heavy burden trying to acquire supplies, clothes and other necessary items for their children to start the new school year. If eligible, the family will receive a backpack filled with school supplies, socks and underwear. Last year, Mid Michigan Community Action was able to offer a back to school program for families in need utilizing American Recovery and Reinvestment Act funds. Funds were not available to offer the program this year. Community Action staff collected the socks and cash donations with fundraisers including casual days and auctioning off the Executive Director’s parking spot. “As an agency, we continue to look for opportunities to collaborate with organizations that are focused on helping those in need,” Wainman said.